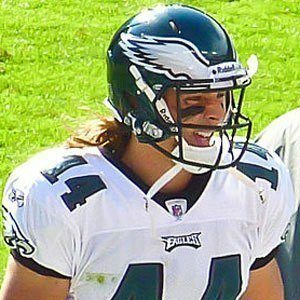 NFL wide receiver and free agent who played for the Philadelphia Eagles from 2010-2015. He had his breakout campaign in 2013, catching 47 passes for 835 yards and 8 touchdowns. He was an All-State wide receiver and free safety at Clearwater Central Catholic High School in Florida. His sister, Lindsey, became a soccer player at the University of Florida. He won two BCS National Championships with Tim Tebow while playing for the University of Florida.